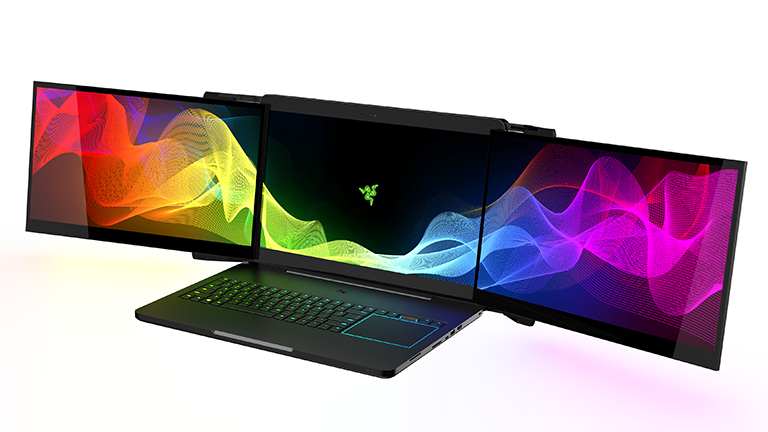 Razer has unveiled "Project Valerie", the world's first gaming laptop installed with three individual 4K, G-Sync displays. The laptop, which is a concept, has a main screen and then two auxiliary screens that slide and then fold out either side of the machine's casing to generate a '12K' 180-degree viewing experience. Each screen is a 17.3-inch 4K IGZO display equipped with Nvidia G-Sync technology. Indeed, when all three displays are in operation Project Valerie delivers an insane maximum gaming resolution of 11,520 X 2,160, with the graphical grunt to power such a massive display area coming courtesy of a Nivdia GeForce GTX 1080 GPU. Other things to note include a unibody CNC aluminium chassis, an automated auxiliary screen deployment system with aluminium hinges, as well as a total weight under 12 pounds. Obviously, as a concept, Project Valerie is not to be put on commercial sale, however there's no doubting that if it were then it would cost a pretty penny. From a purely technical level though it sure looks impressive to us here at T3 Towers - that ability to have 12K worth of screen real estate for working and gaming is incredibly desirable. Anyway, you can take a closer look at the system's unique hinged displays in Razer's official reveal video below. If you are at CES 2017 in Las Vegas, you can also go find Razer and check it out in person at the company's display booth. As ever, more information about Razer's Project Valerie can be found on the company's official website.